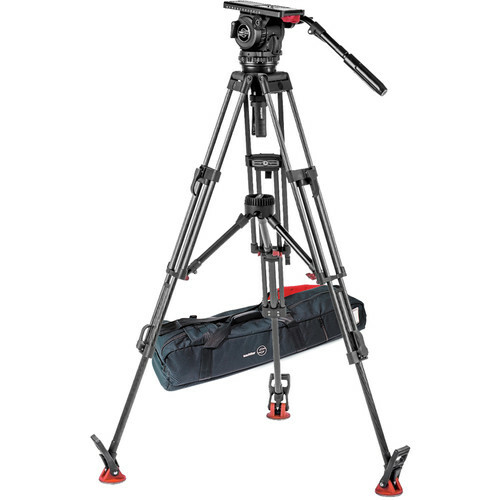 The Sachtler Video 18 S2 Fluid Head & ENG 2 CF Tripod System comprises of the Video 18 S2 head, ENG 2 CF carbon fiber tripod legs, mid-level spreader, set of three rubber feet, and a padded bag. The fluid head has a payload capacity of 4 to 44.1 lb with support for DSLR setups, ENG, and digital cinema cameras. It offers sixteen steps of counterbalance and seven steps of pan and tilt drag, along with locks for each axis. The head is packed with features such as temperature resistance, a Touch & Go quick release camera plate, parking positions for spare camera screws, and an illuminated leveling bubble. The fluid head attaches to the dual-stage tripod via a 100mm bowl interface. With the head attached, the tripod offers a height adjustment of 26.4 to 66.1" and collapses to 35". The mid-level spreader and rubber feet hold the tripod legs in position, providing rigidity and stability. The tripod system packs into the padded bag for easy transportation. Able to handle DSLR setups weighing four pounds up to ENG and digital cinema cameras weighing 40 pounds, the Sachtler Video 18 S2 Fluid Head can fit into a wide range of video productions. Sixteen steps of counterbalance and seven steps of pan and tilt drag, along with locks for each axis, let you easily customize the response of the Video 18 S2 to fit your application, be it studio or field production. The top of the Video 18 S2 head is dominated by a sliding balance platform which accepts Sachtler's convenient Touch & Go quick release camera plate. Once the plate is secured, the entire platform adjusts to balance your camera setup. At the front of the platform, parking spaces for 1/4"-20, 3/8"-16, and registration pin screws are available for when they are not being used. Both sides of the head feature rosette mounts for pan handles. A right-side pan handle is included with the Video 18 S2. The base of the head terminates in a 100mm bowl mount for coupling with industry standard tripods, jibs, sliders, or other grip equipment that feature 100mm bowls. The CF 100 ENG 2CF two stage tripod, provides maximum stability and carrying capacity. Constructed and drawn out of one-piece carbon fiber material, it is twist resistant and lighter than dural aluminum. It features a 100mm / 4" bowl, tube diameter of 22mm (0.87") and is fitted with the Sachtler quick clamping system, so you can securely - and visibly - lock the tripod. The CF 100 ENG 2CF's double extension provides greater stability, allowing an extended height range with a payload of 88 lb., and with a weight of only 5.3-lb it's extremely lightweight, solid and stable. Supports up to 88 lb. This Mid-Level Spreader from Sachtler fits all 100 and 150mm bowls (except for short tripods), OB-2000M, Cine 2000, and Cine 2000 medium tripods. It is used when shooting on uneven surfaces such as steps, rocky ground, or slopes. It allows for rapid setup and pull-down by keeping tripod legs at an equal or preset distance relative to each other. It attaches to the center bracket of a tripod and its arms are telescopic to allow for extension of a tripod leg without detaching the spreader. Set of three Sachtler Rubber Feet. Snap these feet onto your tripod when it's not possible to use the dual spiked feet, ideal on slippery and glossy floors. For all Tripods with Off-Ground Spreaders (Except OB-2000/M and Cine 2000/M tripods). The Sachtler ENG 2 Padded Bag is a soft tripod bag designed to carry various Sachtler tripods with fluid heads up to 35" long. The case is made from water-resistant Cordura nylon and can be carried by the interlocking handles or the attached, adjustable shoulder strap. Box Dimensions (LxWxH) 18.0 x 10.3 x 7.9"
Box Dimensions (LxWxH) 29.0 x 8.0 x 7.25"
Box Dimensions (LxWxH) 12.1 x 3.0 x 3.0"
Box Dimensions (LxWxH) 10.9 x 5.8 x 2.95"
Box Dimensions (LxWxH) 39.0 x 12.0 x 5.0"
For 8 thousand dollars does the tripod come with a camera? No, but put your iPhone on it and you will become the next J.J. Abrams.